I love to photograph wedding details. This beautiful Reflection Bay Golf Club wedding included lots of Scottish traditions to their wedding, like roping their hands during the ceremony, the loving cup ceremony. They had also two cakes; a traditional wedding cake, created by Las Vegas costume cakes an a Scottish wedding fruitcake with marzipan, prepared by the groom’s aunt. 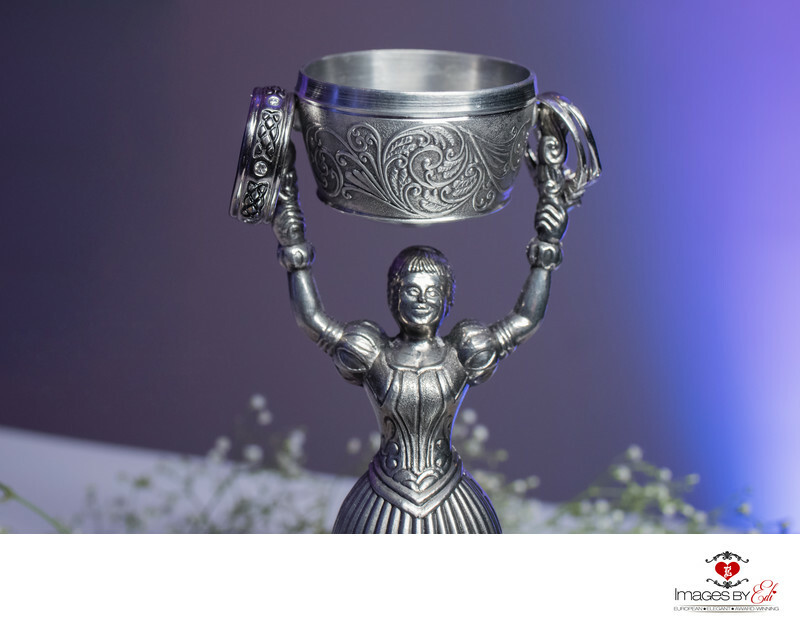 During the loving cup ceremony the bride and the groom was taking a sip in the same time from a beautiful cup, called quiach or traditional Scottish two handled drinking cup (Loving cup) at the wedding is an ancient tradition. Drinking from the same cup is a symbol of the love and trust between them, as a couple. Because it is traditionally ‘the cup of welcome’, drinking from it can also be seen as a way of welcoming the bride and groom into each others’ family. This photo is the top of the traditional Scottish two handled drinking cup holding the couple's ring on the sides, with a beautiful purple backlight hitting the wall providing colorful background for the image. I though the design and the color of the cup and the rings match really well together and stand out from the purple background.